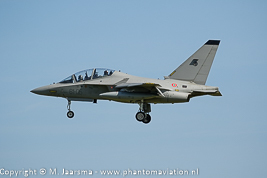 The company states on their website to have 59 orders for the M-346 which is designated the T-346A in Italian Air Force service. Several aviation news media report 15 ordered T-346As for Italy with three options. Aligned with the companies statement the Italian Air Force would have ordered nine aircraft with 9 option to complete the original 15 aircraft purchase. Leonardo announced on December 14, 2018 that the Polish Air Force exercised its option to order four M-346 trainer aircraft as described in the contract signed in March. All eight aicraft currently on order will be delivered by 2022. Leonardo announced on March 27, 2018 that the Polish Air Force ordered four M-346 trainer aircraft with an option for another four aircraft. The additional M-346s will be delivered by December 2020. Original order for eight aircraft with an option for another four. Reported in January 16, 2018 to intend to convert the option into an order including an option for another four M-346s. In above report listed as opportunity until contract has been signed. 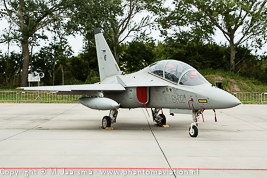 The M-346s will be based at Deblin and replace the TS-11 Iskra. 11-11-16 Delivery of the first two aircraft 7702 and 7703. 06-06-16 Roll-out of the first aircraft 7701.
officals including the General Commander of the Polish Air Force. 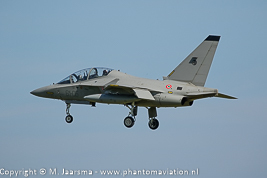 Raytheon will offer the M-346 as T-100 to the USAF T-X program to replace the current Northrop T-38Cs. Leonardo / Raytheon announced on January 25, 2017 that Raytheon withdrew from the competition stating both compenies were unable to reach a business agreement in the best interest for the USAF. The DoD awarded its TX contract to Boeing / Saab. 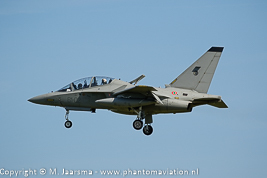 The Italian Air Force send two M-346As to the Luchtmachtdagen (RNLAF open house). 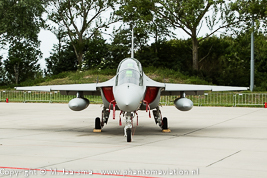 Photo's are taken during the arrival and static display. 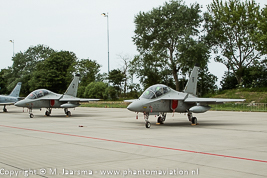 Two M-346s on arrival at Leeuwarden Air Base to take part in the static of the Luchtmachtdagen 2016.